Owl Butterfly on Majesty Palm. The background is a wall. Please click on the image for larger version, thanks. Nikon D90, Micro-Nikkor 105mm, f/9, 1/125, ISO 400. No crop. Butterfly Festival, Handheld only allowed. Montreal, March 2018. 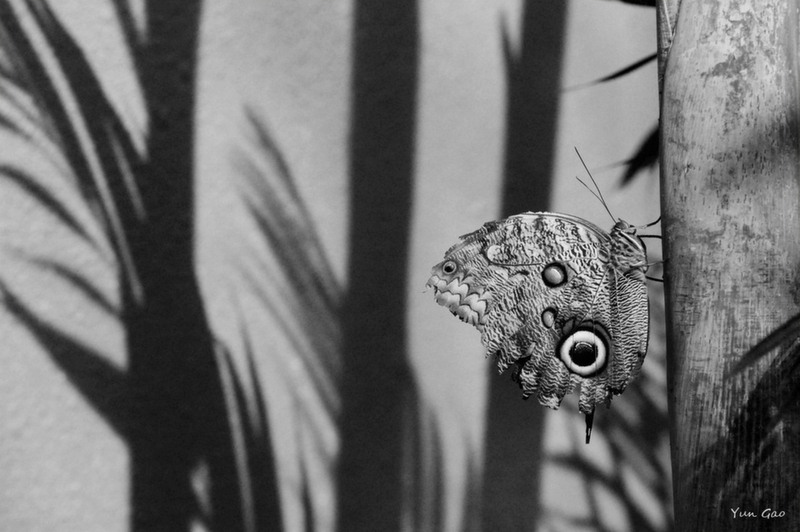 Interesting setting-the butterfly seems to work well in black and white. The details really stand out. I’m not a B&W guy in general, and especially not for birds or butterflies. Your comp is totally counterintuitive to me. Yet, with the shadows on the wall and the graphic bug wing, I find this a really interesting picture! I like the B&W rendering and the composition, the shadows add a nice graphical element. I wish the wall didn't have the texture I see - looks like noise.